Diet in the wild: consists of crustaceans, mollusks, and small fish which swim near the bottom. Body length up to 18 inches. Color is golden with dark spots. Tail has a barb on the base. Ears are just behind the eyes. The motoro is one of three main species of the Potamotrygonidae family. The three main genera of freshwater stingrays from South America are Potamotrygon, Plesiotrygon and Paratrygon. 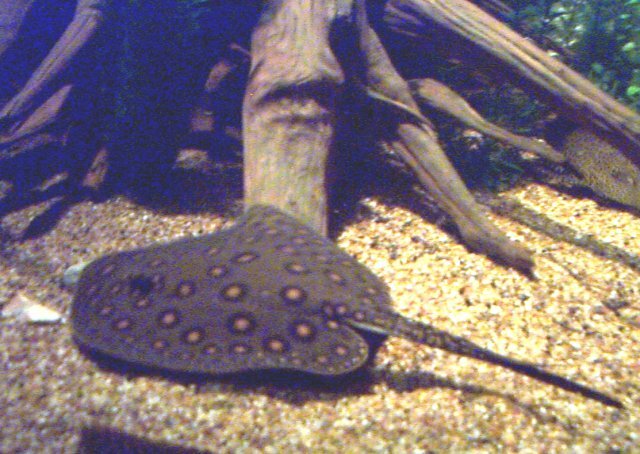 The motoro ray is in the species Potamotrygon. The origin of the Potamotrygon is that they are usually neotropical river stingrays that have adapted to freshwater by using a salt secreting rectal gland as well as a suppressed concentration of urea in body fluids. These stingrays are normally found at the bottom of rivers feeding on almost anything on the river bottom. The typical diet in the wild is mainly small fishes, insects and crustaceans. They also posses a powerful sting that can cause severe pain that normally requires medical attention. The stingers are replaced up to three times a year. The species are typically not very fast swimmers. The technique used in order to capture prey is to trap the prey under its disc, then slowly adjusting its mouth to the trapped prey until they can swallow it. One key adaptation that the motoro ray possesses is that its gills are located on the top of the head. This adaptation allows the motoro to breathe comfortably while waiting under the sand for food. Although the stingray does have a poisonous stinger the stingray is a very gentle and peaceful animal. The sting it delivers is a painful one, but the motoro is definitely not aggressive toward humans. The primary use of its stinger is in self-defense. More often then not the cause of a human to be stung by one of these gentle creatures is if they are stepped on. One way to prevent this from happening is for people to shuffle their feet while traveling in areas of water that may be inhabited by rays. There is no surprise that people step on these creatures because they do lie motionless buried in the sand, and they are very well camouflaged. When a motoro is stepped on it subconsiously elicits a reflex response that causes the ray to raise its tail and extend the stinger perpendicularly. People who are stung are usually stung in the calf area. It is sad for me to say that one of the Ft. Worth Zoo's motoros died early in November this year. It became lodged between a tree and the wall of the tank. Fortunately the other motoro is still very healthy. The zoo is curently looking for a male that they can breed with the female that they currently have. The motoro at the zoo acts much like it would if it was in nature. It sits on the bottom of the tank ignoring the other fish. List of Zoo Home Pages.